As the first, we need to have a Pendrive which contains 4 GB or more space in the simple word we need to have 4gb or 8gb pen drive for this processes so here we go…. A ReadyBoost is designed to help your computer system memory. When someone is running their PC at low memory they face more problems like hanging freezing and much more and the biggest issue is that we can’t run multiple tasks at the same time. ReadyBoost works with pen drive as well as our system drive. In Windows seven we can create it easily. When your computer connected to ReadyBoost, you can use flash drive memory as RAM. As we know that the laptops and computer contain limited amount of ram and whenever we want to play any game, it requires some minimum requirements, but after some years, latest with high graphic games arrives on the market then we need some extra ram which will costly for our pocket. So in this can we can use our pen drive as external USB ram which will boost the performance of the PC in just a minute. It doesn’t require any big investment only just need USB and some mind. Now you can make USB ram for your windows 7 operating system also use in windows 10. Follow the all above methods for creating bootable Pendrive and then just you need to copy the windows 7 or windows 10 files and paste them in pendrive. After copying, your Pendrive will work as windows 7 installer. 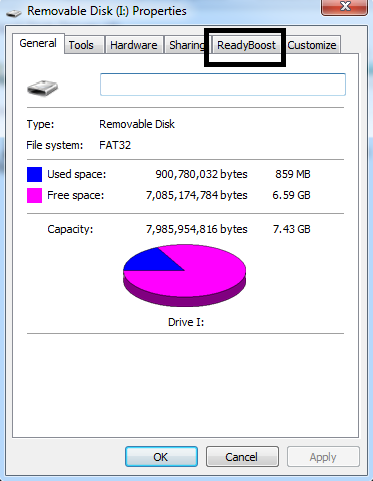 By using this method you can make any bootable Pendrive, enjoy this. So, Guys, we have mentioned how to use/make pen drive as ram for your laptop and computer. You can boost the performance of a computer system by using external USB ram. It will help you to play some big software and games on your same cheap PC specification, but it requires some additional things like you need pen drive for creating bootable ram for your computer. 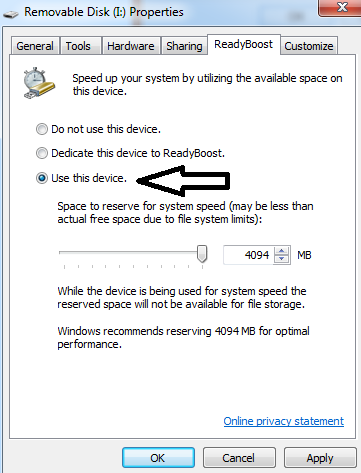 After applying ready boost on pen drive, you will able to use it as external RAM, or you can use it as external ram for a laptop. I think it’s done. If you feel any problem while creation of external ram then don’t forget to shoot the comment below. I will surely read them and answer them. And thanks for visiting my blog.